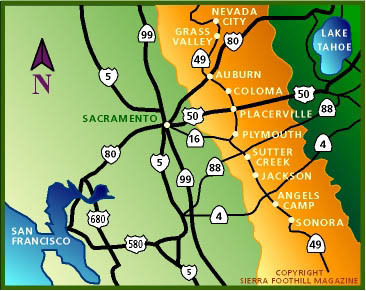 Here's a great .pdf map of the Gold Country supplied by the state of California. You'll need a free program called Adobe Acrobat Reader (instructions for getting it provided on the web page). Are you a person who loves maps of all kinds? Then this site, from the California Environmental Resources System (CERES) is for you. Look at Sierra region maps that show vegetation, topography, land ownership and more. This outstanding interactive map from California Gold Country/Highway 49 Revisited highlights Gold Country communities and provides richly detailed historical narratives on each. Please note: all photographs and other illustrations on this site are © sierrafoothillmagazine.com. Do not copy without permission.